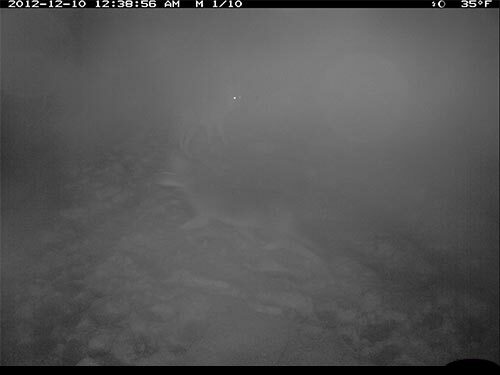 12:38 am on Dec. 10, two wolves in mist. One is upper mid center, looking at the camera with noticeable eyeshine, the other is between that wolf and the camera, moving to the left. In December 2012, Olivia Fletcher of Juneau began a science fair project looking at red squirrel habitat use and preferences. Two USFWS scientists helped mentor her work, and provided a remote, motion-triggered trail camera for the study. While she did get some pictures of squirrels, she captured some surprising images of wolves in the forest adjacent to downtown Juneau. The infra-red flash renders the images in black and white.